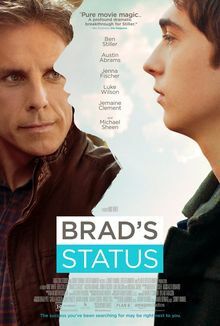 Brad Sloan (Ben Stiller) owns a non-profit organization, and lives a comfortable life with his loving wife and son, but cannot help imagining how his friends Craig Fisher (Michael Sheen), Billy Wearslter (Jemaine Clement), Jason Hatfield (Luke Wilson), and Nick Pascale (Mike White) are rich and accomplished. Craig works in the White House, published a best-selling book, and constant voice in political issues; Jason owns a hedge fund firm; Billy sold a company he founded, bought a private island and retired; and Nick is a Hollywood director. His wife Melanie (Jenna Fischer) tries to comfort Brad, telling him that they don't need to compare themselves to the wealthiest 1%. Read more on Wikipedia.